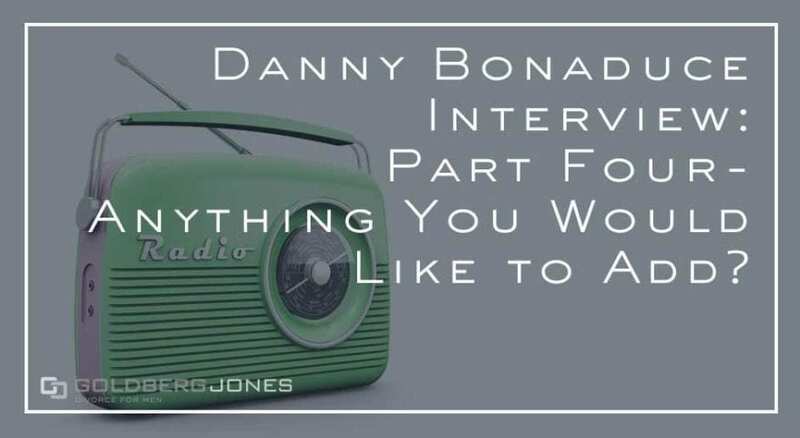 One the first Wednesday of every month, Rick Jones, our founding partner, stops by The Danny Bonaduce & Sarah Morning Show to answer family law questions from callers. Normally Rick and Danny are the ones who take questions from callers, but we thought it would be enlightening to flip the script. Read Part One of the Danny Interview: Do You Think You Got a Fair Shake? Danny: “Not dying, but I thought of it just this moment, ‘Goldberg Jones -Divorce For Men.’ If that had been around when I was getting a divorce–and I wouldn’t have even thought I needed it before–if I had ever heard, ‘call this phone number: Goldberg Jones – Divorce For Men,’ I’d have called that in a minute.